Vaccines are considered one of the greatest global health achievements. According to the World Health Organization, vaccines prevent an estimated 2 to 3 million deaths worldwide every year. Here in Canada, vaccines have saved more lives than any other medical intervention in the past 50 years. Before vaccines were available, many Canadians died or were hospitalized from diseases such as measles, diphtheria, Hib and polio. Today, such diseases are rarely seen in Canada, however the viruses and bacteria that cause these diseases still exist. This is why we need to keep vaccinating against these diseases - if we stop, these diseases will come back. 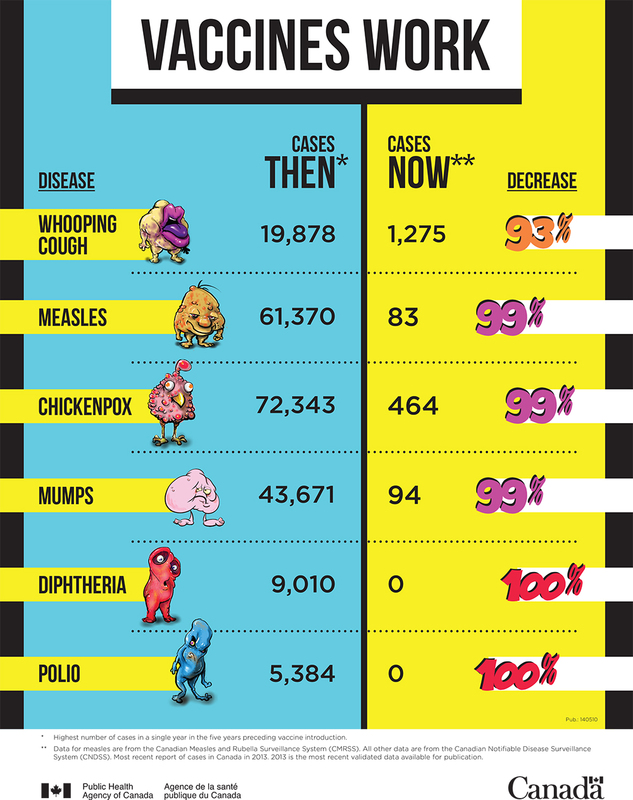 This infographic from the Public Health Agency of Canada compares the number of cases of vaccine-preventable diseases in Canada before and after the introduction of each vaccine. Review the graphic to see just how effective vaccines have been at reducing disease in Canada and then test your knowledge with the quiz and earn vaccines!